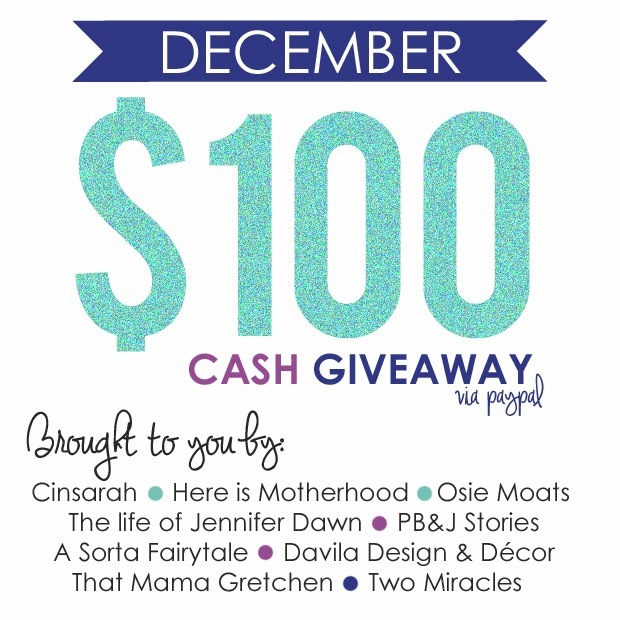 My sponsors, bloggy friends and I have a SUPER AWESOME giveaway for you guys today! Who wants $100 cash via paypal? UM who doesn't? Cash is always good, so make sure to enter for your chance to win! This giveaway ends THIS SUNDAY December 22nd and the winner will receive their cash on Monday December 23rd. A Garmin for running. Thank you. I would buy a nutribullet! I would pay for this ladies weekend I'm getting in April! Sounds amazing! Thanks! I'd spend it on clothes! I would get a blender. I would use the money to take my boyfriend out for a nice dinner for his (and my) birthday next month! I would buy a cute tartan button down from j.crew! I would use it towards a laptop. I would get a nice leather jacket!! I would go shopping on etsy! it would help me buy a new lens for my camera! I'd love to buy a new winter coat! I would shop on etsy! I would put it towards a little trip for my husband and kids. I would use it for my end of the year trip to Oklahoma! Definitely need boots since I moved to Montana, and on the renovations were doing in the house we bought this year. i would get new clothes for my babies! I would put it towards some boots. I'd probably buy random house things like extra toilet paper, diapers and what nots.